Though carbon fiber is by no means a new material, its increased presence in the collision repair industry as more and more manufacturers introduce it into their vehicle designs demands the need for a better understanding of how shops can successfully — and safely — work with it. 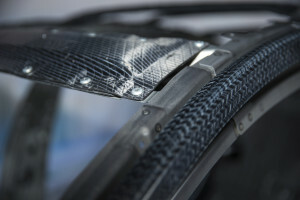 Many repairers may have seen carbon-fiber components on vehicles in their shops before. It’s lighter and stronger than aluminum or traditional steel; however, carbon-fiber doesn’t have the flexibility of its counterparts. That means when it comes to working on a vehicle containing carbon-fiber elements, damaged pieces must often be replaced, not repaired. And as Mark Allen, collision programs and workshop equipment specialist for Audi — an automaker whose Audi R8 and Lamborghini Huracán both utilize a hybrid construction of carbon fiber combined with aluminum — explains, working on a material like carbon fiber must be approached with these unique characteristics in mind. The R8 and Huracán in particular feature aluminum construction with the integration of carbon fiber modules, and as a result, cross-contamination in the workplace should be addressed. “Carbon fiber will corrode aluminum,” Allen said. “It will also corrode steel. The other thing to remember is that carbon will carry a charge. Gary Wano Jr., executive vice president of G.W. and Son Auto Body, whose facility has received factory training to work on the carbon-fiber reinforced plastic used in the BMW i3 and i8, explained that a shop looking to safely repair these advanced materials must be fully committed to doing it per the manufacturer’s recommendations. Like any other new initiative in collision repair, both Allen and Wano said that the most important tool for preparedness continues to be continuous and consistent education.